The 20016-17 season marks Carl Jeff Bianchi’s twenty-sixth year as the conductor of the American Youth Symphonic Orchestra. From 1998-2014, Mr. Bianchi was the director of Virginia’s Ambassadors of Music’s summer tour to Europe. A current member of Phi Beta Mu, Mr. Bianchi recently received its Hall of Fame Distinguished Service Award. He’s also a member of the National Band Association (NBA), as well as a past Member-at-Large on the Board of Directors of the NBA. 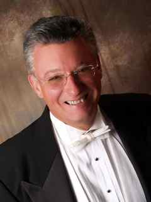 A noted clinician, adjudicator and conductor, Mr. Bianchi was elected to membership in The American Bandmasters Association (ABA) in 1987 and he subsequently served as its 70th President for 2007-2008.